A day in the life of a network engineer includes managing and troubleshooting applications. Others call it Application Performance Monitoring (APM). You call it “the Blame Game.” As a network guru, what APM solution is right for you? What features will help you the most? This guide provides the pros and cons to the different APM approaches. As network engineers spend more time monitoring and troubleshooting applications, the right APM solution is critical for ensuring service uptime and quickly spotting and resolving degraded performance. 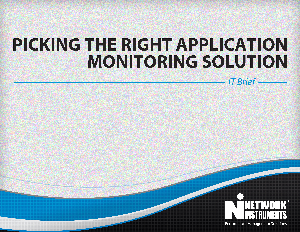 By understanding the concept of application performance monitoring and essential capabilities to have in a monitoring solution, you can ensure your network team can stay on top of service quality and application challenges.